One night in 2009, a black bear was spotted by five different people near Adobe Creek in Petaluma. After being chased by a helicopter, the bear followed that creek back up and over Sonoma Mountain to return to Napa County from whence he or she had probably started. It is likely that this adventurous ursine was using the Sonoma Valley Wildlife Corridor to travel from Napa County through the Sonoma Valley and up and over Sonoma Mountain. This bear didn’t just drop into Petaluma — he or she had been able to travel a long distance, safely and mostly unseen, through existing land and creek corridors. Such corridors are essential for wildlife passage — not just for large carnivores, like bear and mountain lion, but for the many smaller critters as well, like raccoon, fox and bobcat. 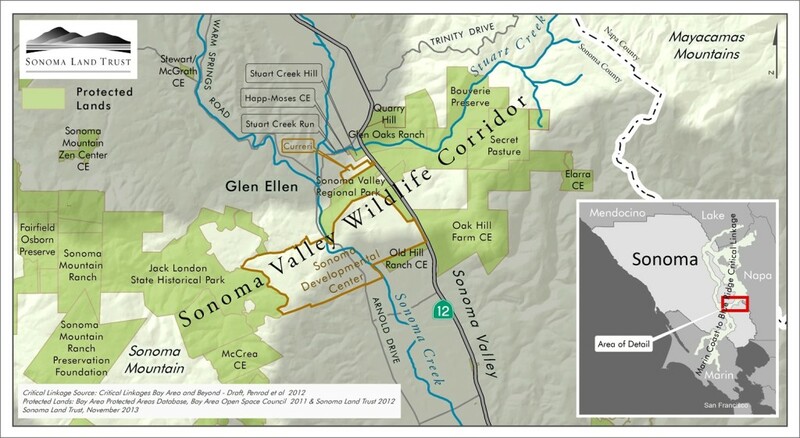 Sonoma Land Trust has embarked on a multi-year project to keep open a narrow pinch point in the high-priority Sonoma Valley Wildlife Corridor that is at serious risk of closing up. Five miles long and only three-quarters of a mile wide at its narrowest point—the “pinch point”—the Sonoma Valley Wildlife Corridor stretches from Sonoma Mountain, across Sonoma Creek and the valley floor, and east to the top of the Mayacamas range. 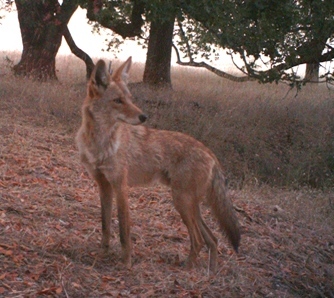 It is located within the “Marin Coast to Blue Ridge Critical Linkage” identified in the Bay Area Critical Linkages Project and Conservation Lands Network, both projects of the Bay Area Open Space Council. Because of the work of SLT, SMP, and others over the years, more than 8,000 acres of the corridor are already protected as natural land. It is the unprotected land at the heart of the wildlife corridor on which efforts are now focused. Ensuring that wildlife can move safely through the landscape so their populations can persist in the face of development and climate change projections is the goal of this large-scale project. Acquiring new properties is only one way of accomplishing this. “We can’t afford to buy the entire corridor, nor would we want to because collaborating with private landowners is a very effective conservation strategy,” says Wendy Eliot, Sonoma Land Trust’s conservation director. “So we are using a variety of land protection tools to protect and enhance the corridor’s permeability, such as deed restrictions and new types of conservation easements and neighbor agreements — along with purchasing at-risk parcels.” SLT staff is developing model conservation easement language, focused on “wildlife freedom of movement” that will be used by many conservation groups working to secure wildlife corridors. To validate the theory that this area is operating as a functional wildlife corridor, SLT has placed wildlife cameras on Sonoma Mountain and up and down the valley to collect data on the animals who live there. Cameras have captured mountain lion, fox, dueling bucks, opossum, bobcat, skunk, coyote, turkey vultures, jackrabbits, squirrels, and more. The role of SDC wildlands is crucial to preservation of the wildlife corridor. The SDC Coalition, of which SMP and SLT are a part, aims to create a scenario in which the clients’ needs are served while providing urgent environmental protections — for the wildlife corridor, watershed preservation and public access. Successful protection of the undeveloped portions of the SDC would directly link more than 9,000 acres of protected land and help ensure the continued movement of wildlife across the Sonoma Valley and beyond. There are no do-overs once land is developed. • Modify vegetation management: Protect your home from wildfire, but leave enough cover for wildlife. Back in September 2008, as the economy moved closer to the brink, not much was happening on the local real estate front besides foreclosure sales. But one opportunity quietly emerged that launched a frenzy of activity and a lot of optimism in a generally economic time. The opportunity also gave leaders in SMP a chance to create a wonderful story with a happy ending, through teamwork, old friends working together, their daughters learning to work together and the cooperation and coordination of public agencies and on-profits. The opportunity arose when a 287-acre parcel near the summit of Sonoma Mountain known as the Stevenson Ranch came up for sale. Kirsten Lindquist, an agent for Sotheby’s in Sonoma, learned of the offering by accident, but immediately recognized the enormity of the chance to obtain and preserve this property for use by the public. She informed her mother, Mickey Cooke, long time resident and founding member of SMP. Mickey told Kirsten to call Mickey’s childhood friend and fellow SMP leader, Pat Eliot. Pat, busy packing for a hiking trip in Europe, quickly called her own daughter, Wendy Eliot, conservation director for the Sonoma Land Trust. And so it began. Ted Eliot, Pat’s husband and campaign manager for the recent ballot initiative that renewed funding for the Sonoma County Agricultural and Open Space District (OSD), got on the phone to Andrea Mackenzie, then general manager of the OSD; Ralph Benson, executive director of the Sonoma Land Trust and Valerie Brown, supervisor for District 1. Everyone recognized how special this opportunity was. Over the next two months, while the economy crashed and most of us struggled to confront the holidays with reduced resources, Wendy and Andrea worked intensely to put together a deal that would satisfy the seller who demand the sale close by the end of the year. It was an unusually tight time frame for a conservation sale, which, as in this case, usually involves financing from more than one source. And financing options were shrinking. Through long hours, diligent negotiating, a persuasive case for the public good and the trust and bonding that comes from old friendships and shared passions, they made the sale and the deadline. Kirsten served as the buyer’s agent (a condition imposed by the seller) and then donated $50,000 back to the Land Trust. Mickey and Pat cheered their daughters on, added historic information to help make the case for funding and delighted in the new alliances being formed in the process. Wendy and Andrea developed the strategy and negotiated carefully, coming up with $125,000 from the Land Trust for an initial deposit, and then $8.45 million from the Open Space District and $1.5 million from the California Coastal Conservancy. The final piece from the conservancy was the last check issued by the state before its funding freeze took effect; the deal was a cliffhanger to the end. Now, the mountaintop where Mickey Cooke and Pat Eliot rode their horses as young women in the 1940s has been saved forever as open space by their daughters in the first decade of the 21st century. The acquisition engaged senior personal in the agencies and non-profits in a way they hadn’t previously experienced, leading to the possibility of future collaborations.